Real Madrid vs Athletic Bilbao Live Streaming Online: How to Get Spanish La Liga 2018–19 Match Live Telecast on TV & Free Football Score Updates in Indian Time? 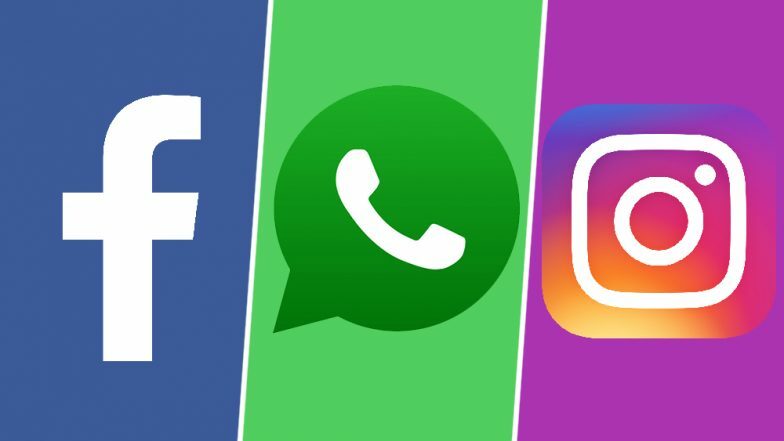 Several users on Sunday across the globe faced trouble accessing their accounts on Facebook, Instagram and WhatsApp. This happened because Facebook, Instagram and WhatsApp services reportedly blacked out in Europe and Asia. Though Facebook Inc. claimed that it has restored the services, some users still were not able to access their social networking accounts. Moreover, the company hasn't specified the exact cause for this downtime across its social media platforms. Facebook spokesperson mentioned, "Earlier today, some people may have experienced trouble connecting to the family of apps. The issue has since been resolved; we’re sorry for any inconvenience." This is not the first time Facebook has experienced the outage across the globe. To recall, Facebook faced similar outage last month when several users across the globe were not able to access Facebook, WhatsApp and Instagram for over 24 hours. Facebook, WhatsApp Become Fake News Factories in India. According to the media reports, Downdetector.com on Sunday showed that over 12,000 reported issues with Facebook. Similarly, over 3,000 incidents were reported wherein WhatsApp users faced some issues while accessing their WhatsApp accounts whereas over 7,000 incidents were reported with Instagram. The monitoring website's outage map indicated that the blacked was extensively experienced by the users in Asia and Europe. As the fact that the services offered by Facebook Inc. are the most popular ones and they are accessed by several users worldwide. The company has not disclosed the exact reason for the outage. Moreover, there are no reports of breach or cyber-attack on its services.